Earrings with garnets and pearls, 3rd century BCE. Garnets and Rubies are the primary gemstones that celebrate the month of January according to our present day calendar system that most people use. For those who may be interested; listed below are other schools of thought and the corresponding gemstones for the month of January. I will focus on my favourites, Garnets and Emeralds for this blog; being as I am a Capricorn so this is my month to celebrate!!! The name Garnet comes from the Latin word “garanatus” which means seed like, in reference to its’ resemblance of the small bright red seeds you find inside a pomegranate. A pomegranate in Greek mythology was associated with the gift of love and eternity. Garnet today is still associated with love and can be given on the second, sixth or nineteenth year of marriage anniversaries. A popular gemstone throughout history; a Garnet gemstone necklace dating back to 3000 BC was found in the grave of a young man. In ancient times and to this day, what is now the Czech Republic, is famous for its Garnets. Castles and churches were lavishing decorated with these beautiful red crystal like gemstones. Noah is said to have used a glowing cut garnet to illuminate his ark through the stormy seas. Moslems believe that garnets illuminate what they call their Fourth Heaven. And the Greeks believes it guards children from drowning. In more modern times, it is considered beneficial to those in the business world, attracting people to the wearer and personal success. One may find Garnets in India, Africa, Russia, South America, Pakistan, Madagascar, and the United States. And also here in the Yukon! A few years back at one of the fly in camps I was working at, one of the fellows out staking came back with a handful of small Garnets he found in a creek. For over six thousand years Emeralds have fascinated cultures throughout the world and today their value can exceed Diamonds. It was sold in Babylonian markets as early as 4000 BC but was only first mentioned in Western literature by Aristotle. He loved the gemstone and believed it helped one to victory in trials and ligation matters, soothed eyesight and protected against epilepsy. Associated in ancient times with the Greek goddess Venus, it was said to protect lovers from unfaithfulness. When the heart was loyal, the emerald would glow a wonderful green colour, but if the heart went astray, the gemstone would loose its colour. The Chinese believe wearing green/ emeralds on Thursdays will bring good luck and of course it is the lucky colour for the Irish! Ancient Roman Bracelet with Emeralds and fine filigree gold work. A favourite gemstone of Cleopatra; not a surprise since one of the earliest records of emerald mining took place in Southern Egypt. 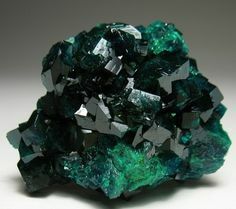 Today some of the finest gemstones come from mines in Columbia. They are also mined in Austria, India, Brazil, South Africa, Norway, Pakistan, the US and the Soviet Union. And interestingly, they were discovered in the Yukon a number of years ago by the prospector who owns the property where I live. Tip: Be sure to remove your emerald jewelry while bathing or washing dishes. The accumulation of soaps and grease on the underside will cause it to loose its brilliance. Clean the stone with water at room temperature, a mild soap and soft toothbrush.